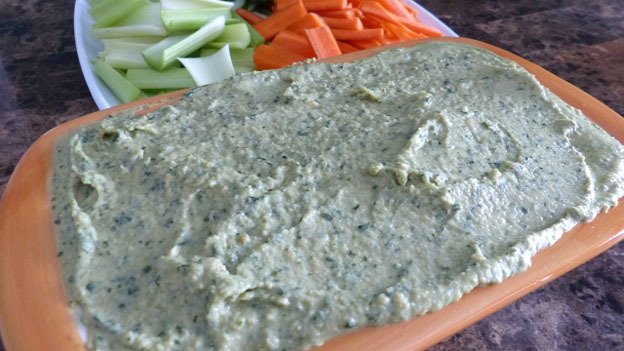 A healthy alternative to store-bought hummus. Combine tahini and lemon juice in a food processor and blend for 1 minute. Scrape sides and bottom of processor bowl then process another 30 seconds. Add olive oil, and spices. Process for 30 seconds; scrape sides and bottom of processing bowl then process another 30 seconds. Add half of the chickpeas to the food processor, process for 1 minute. Scrape sides and bottom of bowl, add remaining chickpeas and process for 1 to 2 minutes or until thick and smooth. Add the lamb’s quarters and process 20 seconds. If the hummus is too thick slowly add 2 to 3 tablespoons of water until the consistency is perfect. Store your hummus in an airtight container and refrigerate up to one week.